This only works with midi input. It has a list box to select midi port, the gui could/should be cleaned up and buttons re sized. It will write midi input port to ini file. In fact, whole file needs a good clean up. Sorry, no more time for this. Shows 2 examples of midi note on to keypress(s) conversion. It does NOT do all that you asked for, I must leave something for you to do. Also - I just commented out some of the midi out parts, they could be removed totally... up to you. - send keypress(s) based on midi input note number. Currently set to midi note numbers 57 and 59. - script will create an inifile first time it loads. - uses contributions by so many different people. - post your creations back to this thread or the midi I/O thread - that way we can all build on it. Notes - All midi in lib stuff is included here in one file, no external dlls, besides winmm.dll required. Based on orbiks winmm.dll call and others' stuff. SendMode Input              ; Recommended for new scripts due to its superior speed and reliability. MsgBox This script requires Windows 2000/XP or later. port_test(numports)             ;  test the ports - check for valid ports? gosub, midiMon                  ; see below - a monitor gui - for learning mostly - you will probably comment this out eventually. Edit the section below to process your midi data the way you want. You will need to use if elese or ifequal ... etc to determine which midi data you want to change and which to pass or to block. MidiMsgDetect(hInput, midiMsg, wMsg) ; Midi input section calls this function each time a midi message is received. Then the midi message is broken up into parts for manipulation. See http://www.midi.org/techspecs/midimessages.php (decimal values). chan 		:= (statusbyte & 0x0f) + 1	; WHAT MIDI CHANNEL IS THE MESSAGE ON? GuiControl,12:, MidiMsOut, MidiMon:%statusbyte% %chan% %byte1% %byte2% ; MidiMs (green text in gui) in midimon gui below - this is for display you will probably comment this out evenually. ; Is midi input a Note On/off message? ;*    Send some keypresses - try testing with NOTEPAD with focus. sleep, 1000           ; wait 1 seccond - sleep timers only shown for reference. May be needed  for response. ; Is midi input a CC? ; do something here, if you want it to do anything with the cc except display it. ;Here is an example of a cc on midi chan 1, operation that presses numlock or capslock depending on which cc (data1) is input. ifequal, statusbyte, 176 ; is data input a cc message, midi ch 1? ifequal, byte1, 90 ; is this cc, cc#90 ? ;*           Is midi input a Program Change? ; however, at this point the only thing that happens is the gui change, not midi is output here. ;*          midi monitor gui - this could be on the tray menu for use when needed. midiMon: ;just a simple gui window for a midi monitor of sorts. Gui, 12: +LastFound +AlwaysOnTop +Caption +ToolWindow  ; +ToolWindow avoids a taskbar button and an alt-tab menu item. Gui,12: Font, s15 ; Set a large font size (32-point). Gui,12: Show, xcenter y0 w500 NoActivate, %version% Midi Monitor - thingy  ; NoActivate avoids deactivating the currently active window. This part is meant to take care of the "under the hood" midi input and output selection and save selection to an ini file. Hopefully it simplifies usage for others out here trying to do things with midi and ahk. * use it as an include. Many different people took part in the creation of this file. global MidiInDevice, version ; MidiOutDevice   ;version var is set at the beginning. Else ; no ini exists and this is either the first run or reset settings. MsgBox, 1, No ini file found, Select midi ports? FileAppend,, %version%.ini ; make one with the following entries. If (midiInDevice > %numports%)          ; if greater than the number of ports on the system. MidiOut := 0 ; set var to 0 as Error state. MidiOut := 1 ;set var to 1 as valid state. ; ---- test to see if ports valid, if either invalid load the gui to select. MsgBox, 49, Midi Port Error!,%MidiInerr%`nLaunch Midi Port Selection! Return ; DO NOTHING - PERHAPS DO THE NOT TEST INSTEAD ABOVE. Gui, 4: add, Button, x10 w205 gSet_Done, Done - Reload script. ;gui, 4: add, checkbox, x10 y+10 vNotShown gDontShow, Do Not Show at startup. Gui, 4: show , , %version% Midi Port Selection ; main window title and command to show it. UDPort:= MidiInPort - 1, MidiInDevice:= UDPort ; probably a much better way do this, I took this from JimF's qwmidi without out editing much.... it does work same with doneoutchange below. MsgBox, 33, %version% - Reset All?, This will delete ALL settings`, and restart this program! Reload                        ; restart the app. Suspend, Permit ; allow Exit to work Paused. I just added this yesterday 3.16.09 Can now quit when Paused. ; Set up midi input and callback_window based on the ini file above. ; nothing below here to edit. Gui, +LastFound 	; set up the window for midi data to arrive. MsgBox, Error, midiInStart Returned %result%`nRight Click on the Tray Icon - Left click on MidiSet to select valid midi_in port. KeyMce/GenMce - mackie emulator for pc keyboard/Convert your controller to mackie. Thank you very much! I really do appreciate you taking the time to do this, and doing it so quickly. And don't worry, this is perfect. I didn't expect you to write the whole thing for me. This is very clearly commented enough for me to manage the rest, and I've dealt with raw midi input before. I just couldn't do it on my own when when all I had was the complete midi input/output package. I've already written a couple of my own keypresses, so that's already 90% of what I need sorted, so I'm happy. Thank you again. You've made my day. I am curious what you are doing, specifically? I hope you will consider posting your finished script back here. Hmmm, curious...i want to send a cc# value 50 when i press a pad on my akai mpd (note on) and send cc# value 0 when releasing the pad (note off). If i play the mpd directly into my daw, it always send a correct note off when releasing the pad. if statusbyte between 128 and 159 ; see range of values for notemsg var defined in autoexec section. Must have something to do with the pads from mpd32 which seem to send some midi commands each time your press the pad harder or softer (without releasing it). I don't have it with me so i will delve into this again at home. 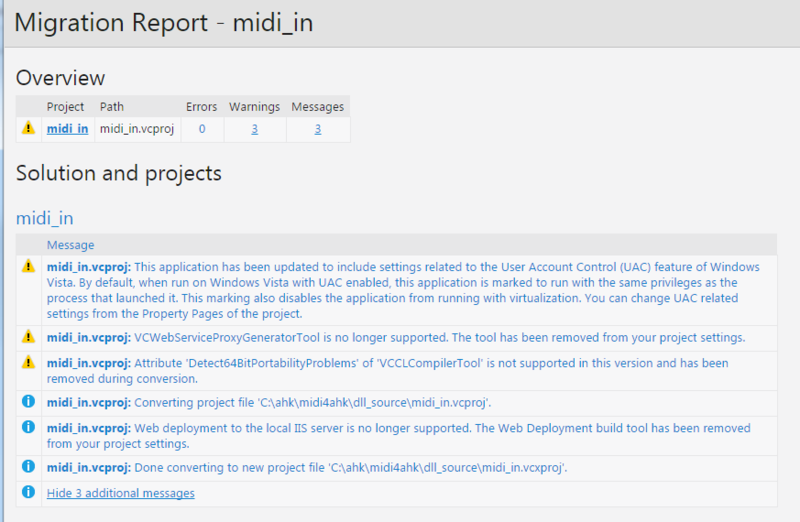 Something else: Can anybody tell me how to send an MMC message with midiOutShortMsg? The third byte is the Device ID. orbik said "In theory you could make the script play sounds on midi input but what's the point of that?" place them in the corresponding velocity ranges for that note. So, if I press the key softly it instantly plays the soft sample. If I hammer the key it plays the louder samples. and people would not have to use a third-party program like Kontakt to play them! Sweet! I used this to create a script that controls the PatchMix DSP of my E-Mu 1212m sound card and my WinAmp Volume, through my Akai LDP-8 drumpad. WinAmp can be controlled with CLAMP, which is a command line tool. (controller 7). Controlling the windows mixer (controller 8) is the easiest part, and works most smootly, because autohotkey has a builtin function SoundSet. ; midi_in_Close()  ; i commented this out because it caused AHK to hang. I hope i'm not breaking other stuff!! WinActivate   ; no need to specify title again, since it will automatically use the "last found" window. Ok... I've built my first sampled instrument. "Aaron's Tattoo Machine Instrument". I tuned my tattoo machine to different pitches by adjusting both the armature bar settings and the machine's voltage. I used a pitch-shifter to fill in the required notes in between, and built three samples for each note's velocities: soft, medium, and loud. as the sound played on its release. There's a problem... polyphony. There needs to be a way to play more than one sound at a time, at the same time. refers to %byte1% to choose the sample to play (for example, with middle C... %byte1% is 60 so the sample 60_soft.wav is played). I'm going to post on the ask-for-help thread about multiple instances of SoundPlay, or for another way to play multiple sounds simultaneously. Thanks very much for figuring this out! The script i posted above (the one to control different software mixers with the Akai midi drumpad), turns out to be a work in progress. First of all, i took the liberty of changing the first two functions of the midi_in_lib.ahk library. You can "ask" for a midi port by number, but since midi/usb devices are pretty much in random order, i wanted to (also) specify a default midi port by name (my drumpad is called "USB Audio Device", which is annoyingly generic, but it works better than a number). MsgBox Cannot load library midi_in.dll"
@ all: Thank you so much for your contribution in this thread! I'm heavily using AHK for two or three years now, and thanks to this thread I was able to control sliders in the picture editor GIMP with faders on a cheap and simple Korg nanoKONTROL2. GIMP allows assigning hotkeys to actions, and w/ a modification of genmce's script I've been able to get the job done. Thus changing the brush tip, brush size, brush opacity and mode, level opacity and mode and lots more with a fader feels much more ergonimic than moving the stylus on the graphic tablet from the picture to controls and back. I am working on converting CC moves of a knob into keypresses. Unfortunately, I receive "Cannot load library midi_in.dll" message here. I checked A_ScriptDir and it is pointing to the folder with dll correctly. Can anybody help? It seems to me that the problem is that DLL is 32-bit and my system is Win7 x64. Can anybody please compile a 64 bit version?